The Preener. The Socialite. The Eater. The Musician. The Sleeper. Five drivers, five vices, five stories, and five crashes. *WHITE FLASH* The Preener looks into her rearview mirror, but instead of seeing the car behind her she sees herself… myself… ourself? I may reflect the world around me, but with her all I wish to show is her face, or rather her flaws. Her eyeliner stops short of the edge, her lipstick is slightly smudged, her foundation is starting to fade. Who will she impress if I don’t show her all this? I hear people nearby say I’m dangerous, but all I do is keep her focused on what’s important. Her eyebrows perfectly plucked, her hair in just the right place, her skin glowing with a beautiful red… Red? There’s no red lights in the ca- *RED FLASH* The Socialite is so popular, I can’t believe how many friends he has! My contacts list is overflowing with numbers, and his car is always full. He can hardly put me down, and I love feeling so special! Like right now, he’s asking out the most well known girl in the whole school! I’ll post it and tell all his friends and family and… is my GPS right? It says he’s going 80, but he’s not that reckless. He just swiped on the notification, so it must just be an error or something. I mean, the turn up ahead is pretty sharp and he goes this way all the time. He’ll be fine, *CRUNCH* The Eater sure is an expert at this! Both hands on me and using her knees to control the wheel? Genius! After all, how else do you eat a family size bag like me? I bet that driver ahead of us would agree, maybe we’ll ask at that stop sign ahead. Um, she does see it right? Oh nevermind, she’s getting some more chips. I’m sure she’ll finish before we get there. See? She’s looking up now, but she does look a little sc- Whoa! *SCREECH* The Musician always knows just what to play. I’ve got all her favorite stations preset, and I’m always at full blast. It rocks! We just listen to the newest hits and jam out together, singing together like there’s no one else around! Oops, looks like our turn is up ahead. She always forgets and rushes to the turn lane, but she might miss it today. That car’s in the way, so she’ll- Why is she turning? Doesn’t she hear the honking? *ZZZ* The Sleeper loves to turn me up on long drives, the heat helps him relax. I blow the warm air all over, like a blanket. He’s been driving all day and deserves to relax. I’m sure closing his eyes for a minute won’t hurt. After all, he’s an experienced driver. He’ll keep control of the wheel, he’ll stop this veering. He’ll be safe. The Preener. The Socialite. The Eater. The Musician. The Sleeper. All were behind the wheel, but were any truly the Controller? All of their vices, the mirror, the phone, the chips, the radio, and the heater, controlled them. They aren’t negative life influences, but they shouldn’t be anything more than a tool or a snack when fully stopped. They can’t drive, but they can still control you. When you drive, put the distractions away, and be the Controller. Hello, it’s me. 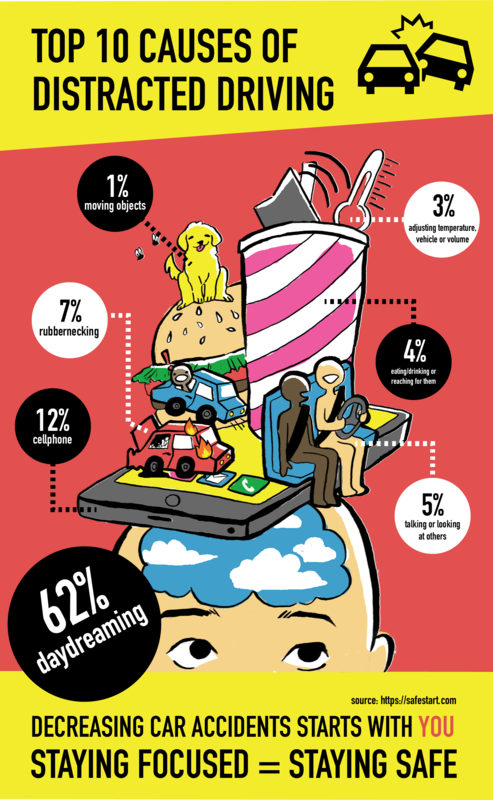 Your attention span. We need to talk. You kind of have a bit of a problem and that problem is affecting me. Now, I know your life is busy and you’ve got a lot happening, but you need to sort out your priorities. I’m talking about driving. You’re a great driver, really, but you’d be lying to yourself if you didn’t admit to being distracted whenever you’re on the road. I mean, the smallest things grab your attention. One minute you’re looking at the road and the next a flashy billboard has you captivated, or a cute dog in another car drives by, or your crush from seventh grade just followed you on social media and you just have to see what he looks like now. I can’t shame that obsession, but talk about wrong place wrong time! Your attention is like a fly buzzing from one place to the next. It’s all over the place, and when you drive, you kind of need it to stay on the task at hand. Yeah, it’s tough. I get it, but you need to think about what’s most important to you. Checking your phone? Or making it home safely and living to see another day. Your life and the lives of your passengers and the lives of those you share the road with are all precious! 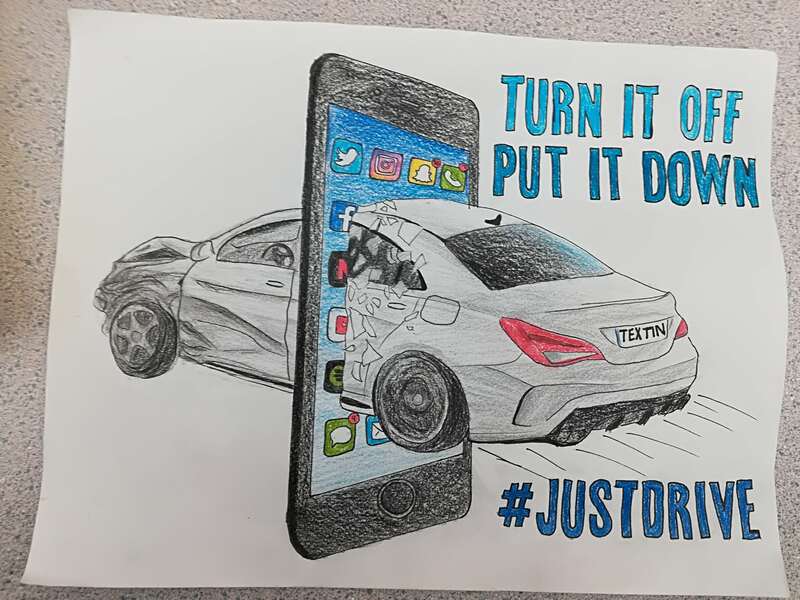 Don’t throw your life, or worse the life of a pedestrian or another driver, away just because you couldn’t handle looking at your phone for ten minutes. You can do it! I believe in you. As your attention span, I know it’ll be rough to stay concentrated, but I’ve seen you focus before and I know you know what’s important in your life. 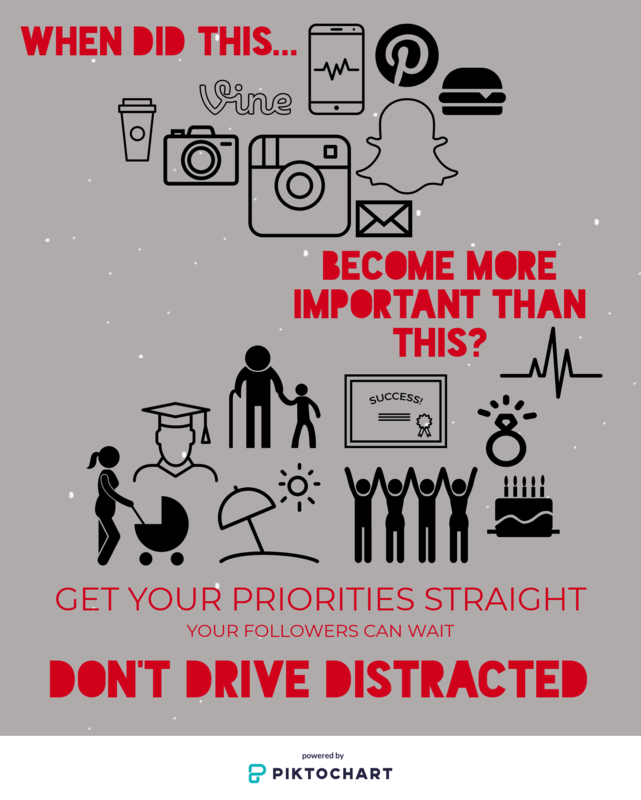 Don’t drive distracted. You leave your house Excited to see your friends, Like any other weekend But it is not any other weekend. It is the day you leave your house, Unaware that it might be the day you leave this world. You are in the car choosing your favorite song, Like you would do any other drive. Although, it is not any other drive, It is the one where your life will change forever. Now, you are finally on your way, Running a little late. Your friends remain impatient, Blowing up your phone. You don’t even contemplate Whether or not you should text them back. Because any other time. You would. So you grab your phone… But this time, isn’t any other time It is not any other text message, Or any other person. …And then everything goes dark This time YOU are the teen In the statistics everyone told you about. 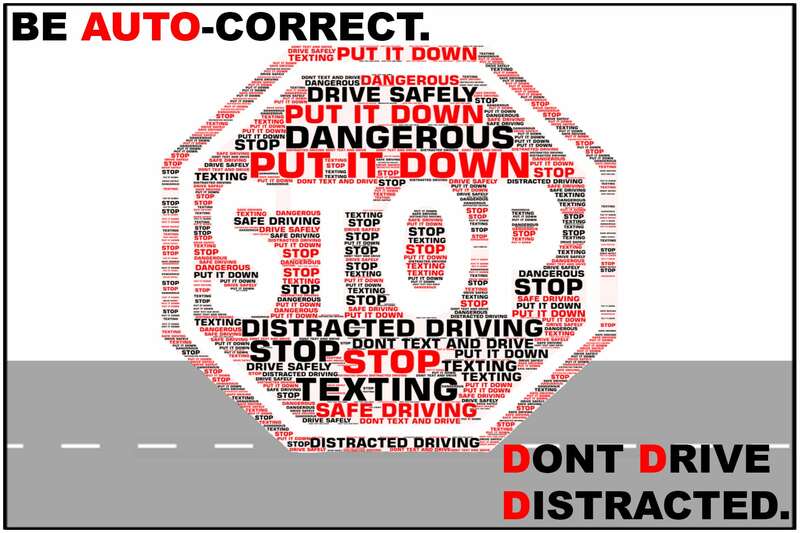 YOU are the victim of texting and driving. You don’t even remember if you pressed send or not. You can’t even put together pieces of what happened. The only hint you get is the familiar smell of a hospital, And the painful sound of your parents crying. Between the beeps of the monitor, And sniffles of your parents You hear the muffled sound of the doctor. “We did everything we could, But she did not make it.” And then it hits you. You are alive, But someone else isn’t. You had hit a 18 year old girl, And she didn’t make it out alive. In the moment of sending a single text, You devalued your own life, And took someone else’s. 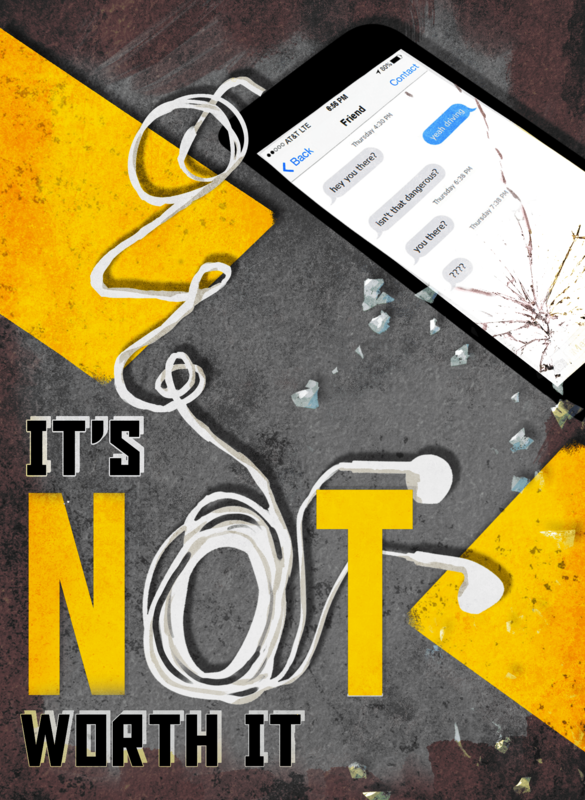 You knew people could end a life with a knife or a gun, But little did you know you would end one with a text message.